If every impressionable fourth-grader in the US had the opportunity to spend a day at the Johnson Space Center in Houston, we probably would never hear about any science or math gap in our country. Hell, John and I even had astronaut dreams after visiting for a day. What an unbelievable mind-expanding day it was. The first extraordinary sight as you approach the Center is the improbable vision of the Space Shuttle Independence perched on top of its 747 launcher. Ridiculous! Outrageous! And, so the day begins…..
Full disclosure here. I had mixed emotions about spending the time and money to visit the JSC (about $30 each, less our AAA discount). I’m not a space nut, nor a science girl. But, I would happily go again tomorrow. There’s so much to see, and it’s such an inspiring experience. The cool thing here is that the JSC is not filled with mock-ups of space stuff. This is where REAL astronauts train on REAL lunar rovers. The Orion capsule is the REAL working/training unit for Mars exploration. It’s unbelievable stuff. We went to the Mission Control Center where early Gemini/Apollo missions were tracked (it’s now used for training). Real-time video from the International Space Station (ISS) ran before our eyes. Like rockets? Redstone, Saturn, and the unbelievable Saturn 5 rockets are there. The Redstone, used to launch the first Mercury capsules, looks like a mere bottle rocket – slender and unmenacing. The last of the Saturn 5 rockets, on the other hand, is unbelievably huge and powerful-looking. As we walked I to the hangar where it’s housed, the folks in front of us actually stopped and gasped upon seeing it. 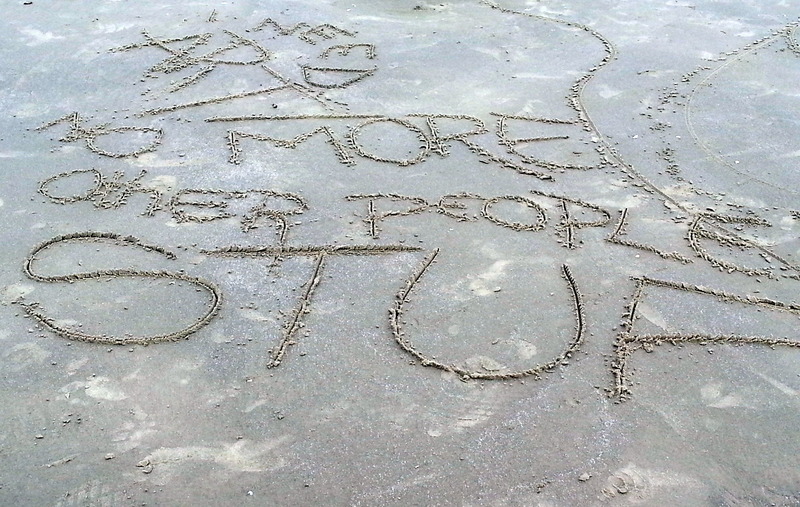 We did too – it’s cartoonishly huge. Beyond comprehension that it would lift vertically off the ground. Of course, our 50 year space program has had its disastrous failures. Apollo I was the first, which results in the deaths of the first three Astro sure, including Grand Rapids’ own Roger B Chaffee, on the right in the photo below. The explosions of Space Shuttles Challenger in 1986 on ascent, and Columbia in 2003 upon re-entry, highlight the danger and the experimental unknown of the US space program. It’s great to watch the enormous progress of the endeavour – single-astronaut shots in the Mercury program, followed by astronauts in tandem orbiting the earth in the Gemini program. We watched the film of Neil Armstrong stepping into the moon’s surface, while Walter Cronkite removed his glasses and wiped a tear from his eye. Did you know there were 135 Space Shuttle missions? That number was astonishing to me. And now, we have the ISS, staffed by crew from many nations. Up next? Mars. I touched a moon rock that was 2.3 billion years old. Actually touched it – I was thrilled. We both passed on putting ourselves in the capsules that would emulate some of the rougher (throw-up) simulations of being an astronaut. Hop aboard the Vomit Comet?? Not me! Here are a few other sights from our JSC day. If you ever have the chance to do this, don’t hesitate. It’s an amazing experience. If you are jaded and uninspired about our future prospects, this will ignite a sense of hope. I was struck by the videos of JFK asking for an astonishing $7 billion 1962 to put a man on the moon. At that point, only the first Mercury capsules had been launched. Yet, in July 1969, Neil Armstrong was stepping on the moon’s surface. Can we not conquer Cancer with an all-out effort, as proposed by President Obama last year? Why not? Let’s dream. This pretty much describes our last few days here in the belly of Texas. Our history lesson has been combined with sketchy weather that has followed us around – changing up from gray, cold and crappy to warm and sunny, then back again. The damned “wintry mix” is in the forecast for the weekend. What!!? But, back to the history lesson. We are closing in on completing our grand tour of the Presidential Museums. The George W Bush Museum in Dallas was the first one this week. It’s the newest of the Presidential Museums, having opened in 2013. Did you know that a President must be out of office for five years before his Museum/Library can open? We didn’t know that either – hope that doesn’t mean that we’ll never get to the Obama Museum in Chicago, since it can’t open before 2022. That sure sounds like a long time away – we sure aren’t getting any younger. We decided to drive to the Museum from our campground at Lake Lewisville, about 20 miles north of Dallas. Then, we parked the truck and left it there, taking the commuter train into downtown Dallas to explore for the rest of the day. What a great stress-free way to explore. Our full-day tickets were $2.50 each. Love being a tourist on public transit! The Bush 43 Museum was interesting, but not really very informative. We left, feeling like we had a better idea of Laura Bush as a person and First Lady than we had of W. The introductory film was not working, so we missed our favorite way of acclimating ourselves to one of these Museums. Of course 9/11 and the horrible events and videos of airplanes slicing into the WTC dominate. The capture of Saddam Hussein (the pistol he had with him is also enshrined there) is featured. Hurricane Katrina. Missing were clips of momentous speeches and personal notes. Few charming (or damning) letters from constituents. We both felt that the Museum was gorgeous, but lacking personality. Gifts from foreign heads of state were breathtaking, especially those from countries in the Middle East. The stunning Christmas in the White House display was still up as well. The Texas Book Depository, from where the shots were fired that killed JFK in 1963, was the other Dallas landmark on our must-see list. (The window on the second from the top story on the right side is where Lee Harvey Oswald fired. That corner, inside, is blocked off by glass, and preserved exactly as it was). No photos are allowed inside…. As with the JFK Museum in Boston, we were were surprised to see the variety of people there. Many had thick foreign accents, and most were too young to have been around for Kennedy’s presidency, but here they were – queued up with their $16 in hand to see this site. What a rush of emotion and remembrance this visit released. I was in 7th grade when Kennedy was shot, and I still remember being in Mr. Gardiner’s geography class when another Mrs. Chaffee (Aunt of Apollo astronaut Roger B Chaffee) burst in with the awful news. The Museum is set up on the sixth floor of the TBD. Every aspect of the Kennedy assassination is covered – logistics of the motorcade, the excruciating frame by frame sequence of the Zapruder film, news broadcasts of the funeral, and Oswald’s assassination by Jack Ruby, and Ruby’s trial. The Warren Commission. There were films of the funeral from all over the world, and I was again struck by Kennedy’s universal popularity. For me, however, the real power of this place was outside. On the street in front of the TBD are two large white Xs – marking the position of Kennedy’s limo when he was struck by each of the two shots. The grassy knoll….it’s all there. Wow – I was surprised at the emotional impact of all this on me, more than 50 years after the fact. We wandered around Dealey Plaza and downtown Dallas. Lots of interesting sights. No new city tour could possibly be complete without us seeking our a brewery, and we found a good one – Braindead Brewery. It was a good day to play tourist. We hopped the train back to the truck, and got back to our campground without incident. Dallas is a huge web of expressway construction – our relative ease of passage was no small matter. They are laying tons and tons of new roadway out there – it’s astonishing. But hey – there’s another Bush Presidential Museum in Texas.The George HW Bush Museum is located on the campus of Texas A & M University in College Station, about 225 miles from Dallas. 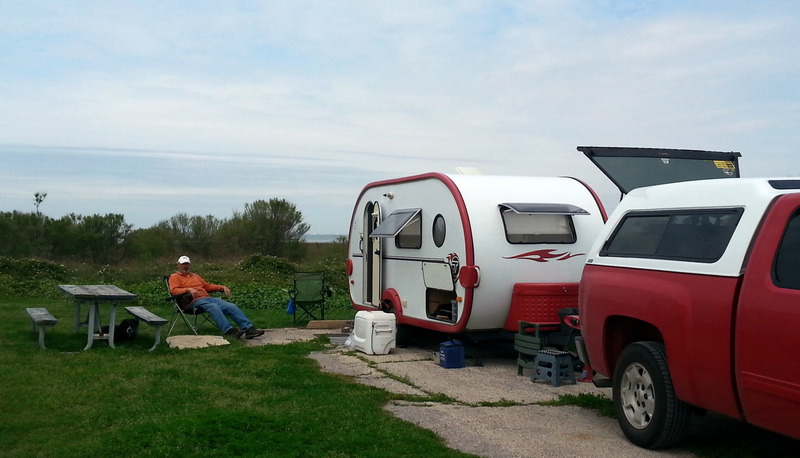 Although we had to camp in an RV park, with limited space (NEVER our first choice), we found a great one at RV Haven. It gave us the option to break out our bikes, and ride to the Museum and around town on a chilly, blustery day. The George HW Bush Museum was very different in feel than the GWB Museum. GHWB had a pretty illustrious life before the Presidency -US Congress, Ambassador to China, UN Ambassador, CIA Director and Vice President. There’s lots of material there, and it left me with a positive feeling for the man, himself. He did begin Desert Storm – heard the term “scud missile” which I hadn’t heard in years. 1000 Points of Light. The dismantling of the Soviet Union and the Berlin Wall. It was an interesting day. He spent an average of three weekends a month at Camp David, so there was a replica of the office there – first time we’ve seen that. I was taken by this photo of GHWB in 2013 with the son of one of his Secret Service Agent’s kids who had leukemia. Bush shaved his head in support of his struggle. Texas A & M is a pretty uninteresting-looking campus. With few exceptions, the buildings are constructed of a blondish stone. They have an astroturf hedge near some of the engineering labs. There is every kind of engineering department you never heard of located there. We cycled through an area where training is done for advanced firefighting techniques (we didn’t notice the No Trespassing signs). Rainroad tanker cars piled on top of each other, an old 737 laying on its belly with the bottom burned out, a chemical pipeline labrnyth. Crazy stuff which requires different techniques than fighting brush or house fires. 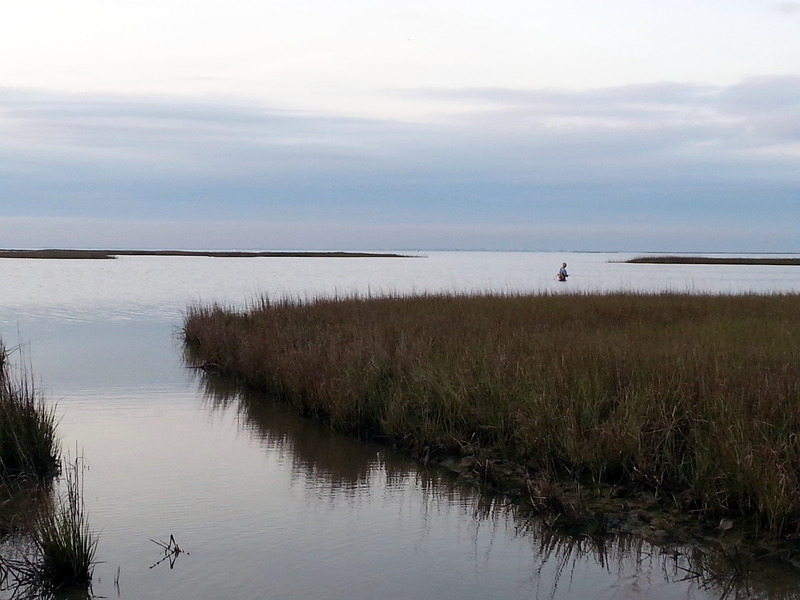 We’re now camped on the Gulf of Mexico at Galveston Island State Park. Beachside. If the wind ever dies down and the temp goes up 20 degrees, our next five days will be fantastic. Right now, it’s howling! 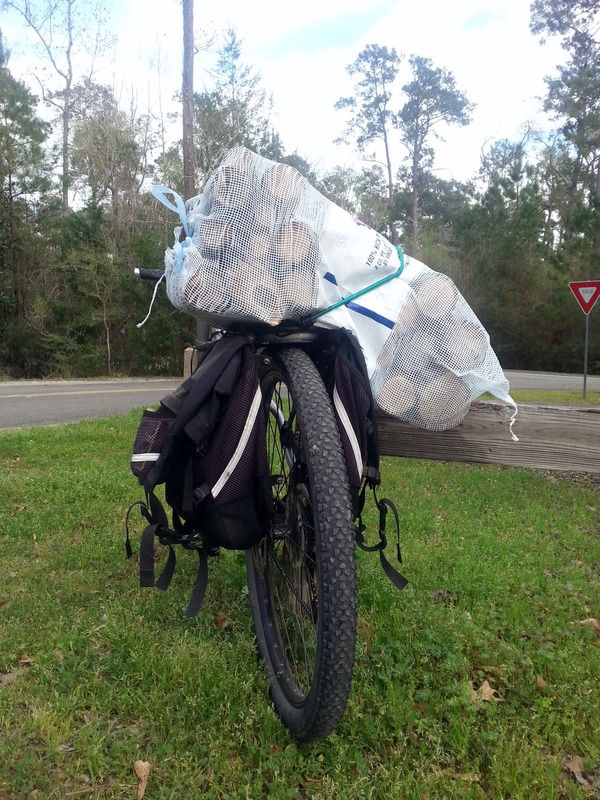 Fourteen days after crossing into Texas from New Mexico, we’ll finally be crossing into Louisiana tomorrow. Whew! It’s been a marathon trek . Seeing the Whooping Cranes at Goose Island was definitely a highpoint – the RV park in Ft. Stockton was a big low. Lots of middle ground. 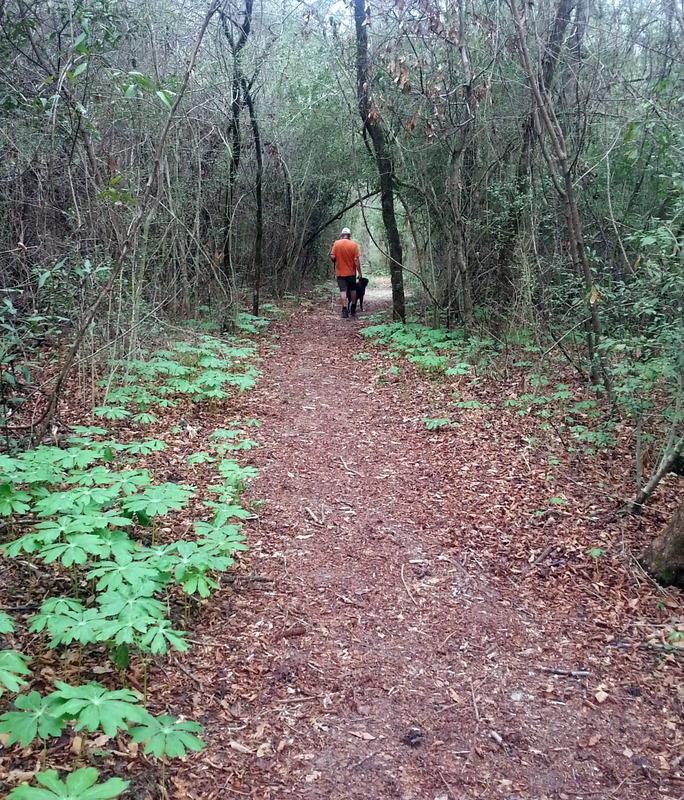 Leaving Hill Country (Austin area), we headed for Galveston Island State Park. In the three years that we’ve wandered around in the Fireball, this is the only place we’ve returned to each year (with the exception of our favorite camping spot in Michigan). Hard to pinpoint the reason for this, other than it’s the perfect storm of history, fabulous scenery, cycling, and food. We enjoy moseying around the beach. 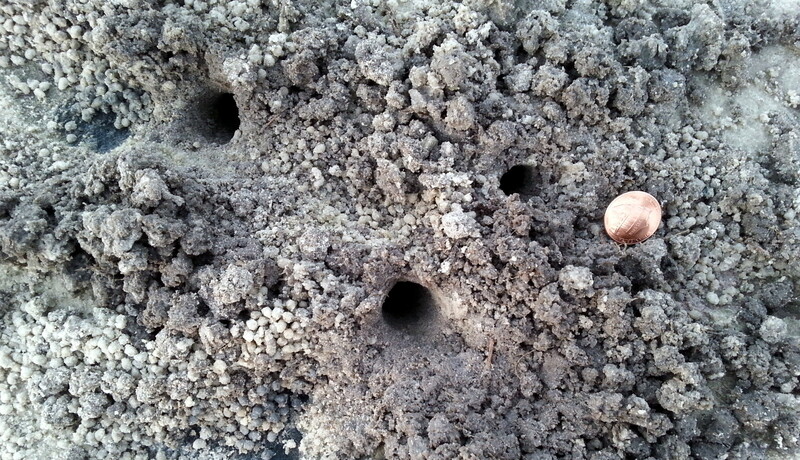 I was told that these holes may be hermit crabs. Further research says (maybe) ghost crabs. In any case, they are curious…. 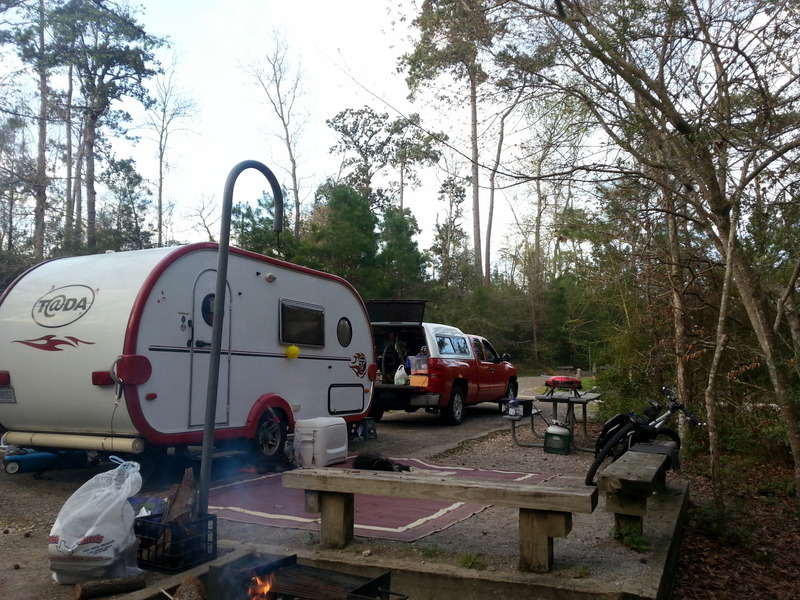 (I put the penny down for size in photo #2) For this first time, though, we were unable to camp on the Gulf. For us, it’s amazing to be camped right on the Gulf of Mexico, where we can hear the surf pounding all night long. But, it’s Spring Break, and we didn’t make reservations early enough. So, we were forced into a spot on the Bayside Loop, which actually should have been pretty great. Except it wasn’t. It was a HIKE, (or actually a bike ride) to the bathroom/shower. We rely on campground facilities for these needs. It was a long way away from our spot. There are no firepits at the campsites. The mosquitos were ridiculous! No fault of the State Park, but we were bombarded!! Even with all of our best pest-protection in place, we had dozens of blood sucking pests inside all night. My feet and legs are a mass of welts. The Fireball ceiling is a bloodbath (where we thought we were carefully plucking mosquitoes off, but actually smashing them into the fabric that covers the ceiling.) Hopefully, the blood is our own. Can’t want to get home to get this cleaned up properly. Ugh. We did have some nice views, though. 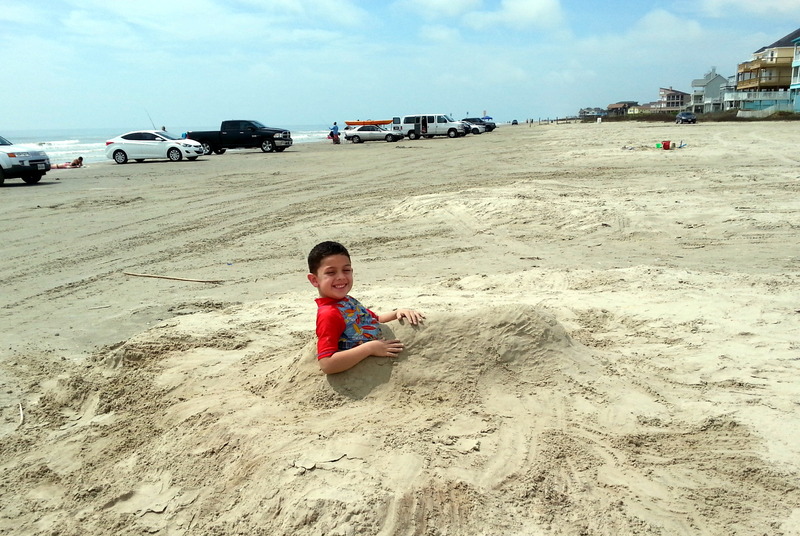 BUT, although it was a soggy, wet campground, it’s still Galveston. We decided to cycle down the beach into town. It’s about 15 miles. 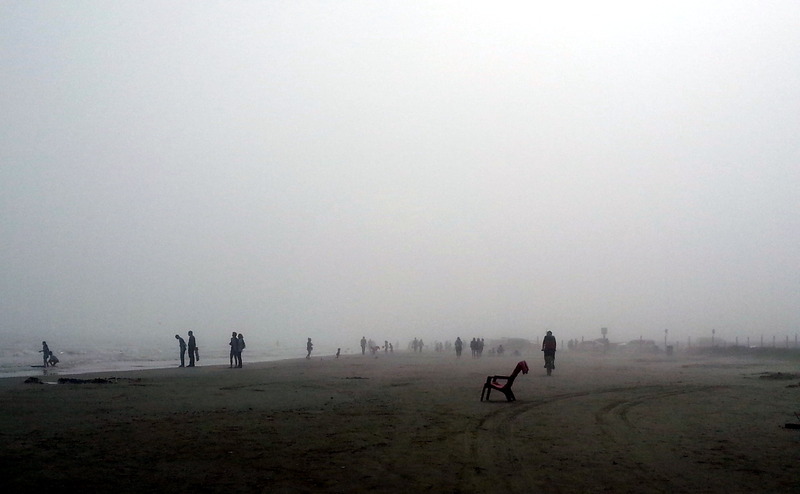 The beach is lively. There are access points for cars, and folks are pulled up right to the surf. Radios are blasting, and there’s a lot of bikinis-babes and muscled-up young men working their magic on each other. Riding directly on the beach is a treat. We don’t get that chance very often. 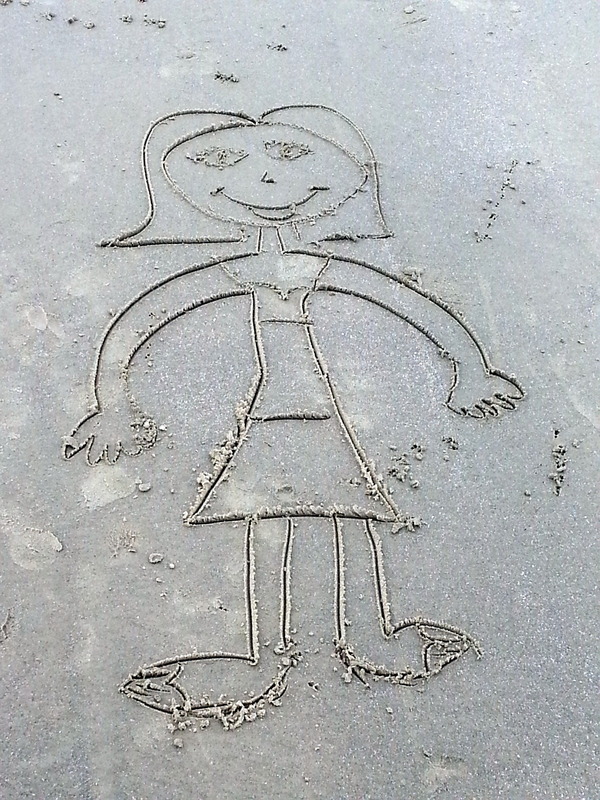 Sand art abounds. A tiny young girl (about 7 years old) had just finished this when I rolled past. 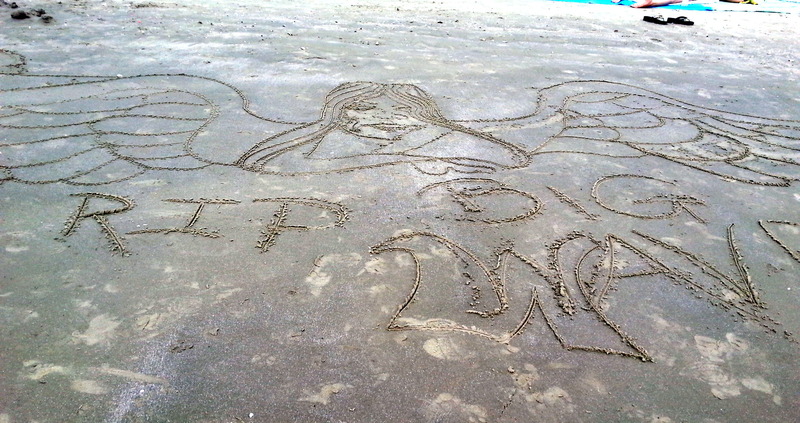 Another guy was finishing his tribute to a friend who had drowned nearby. There’s something for everybody here. We wandered around through the historic area, the touristy area, and the not-so-desirable area. 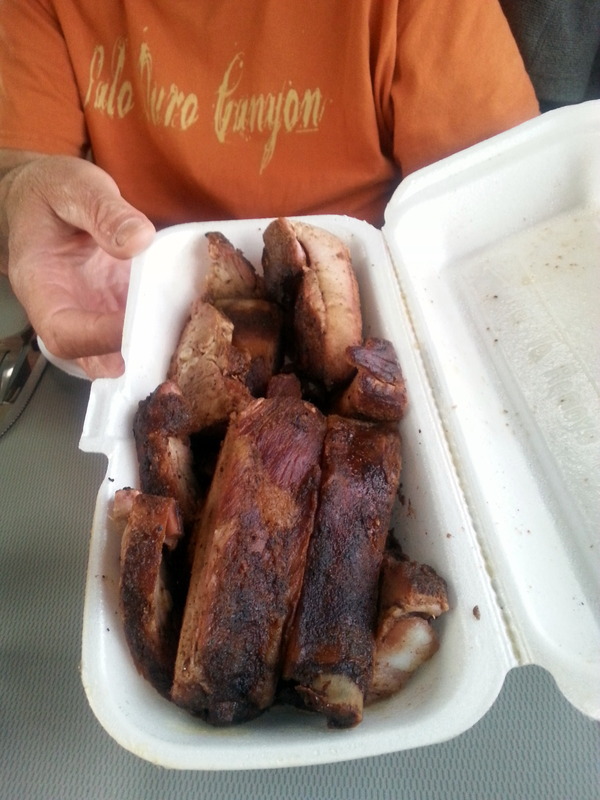 All fun to see.We couldn’t help ourselves, so we stopped for takeout ribs at our favorite BBQ joint from last year. 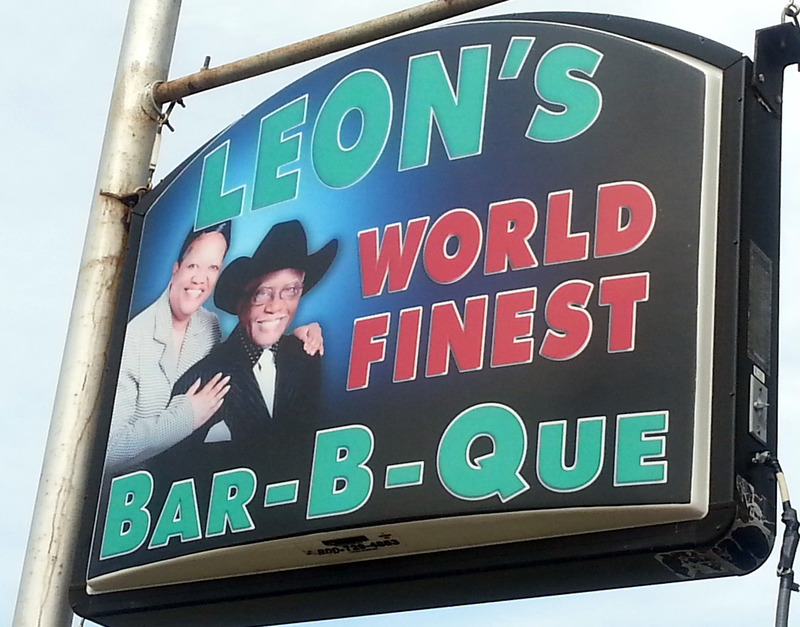 (Sorry, Leon….the Austin folks have you beat.). You still rock, though. We may need a Barbecue Intervention. As we turned toward camp, the fog was rolling in. 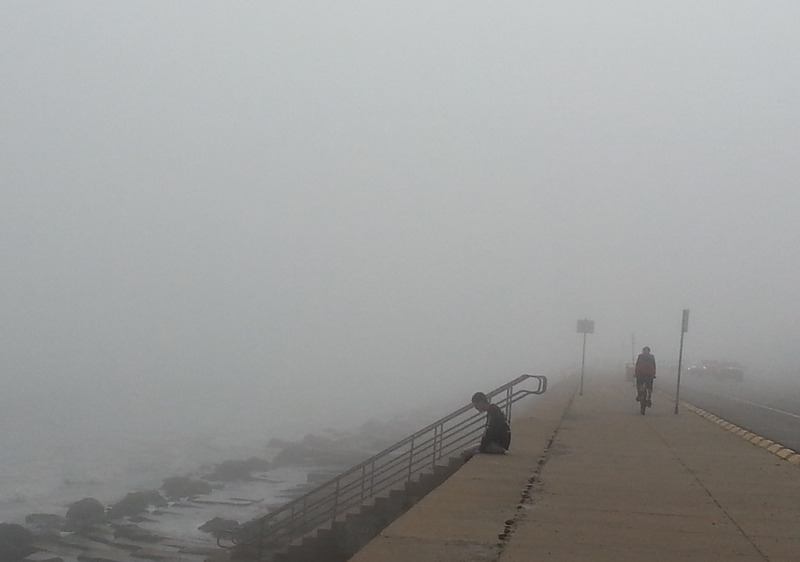 It got chilly in a hurry, and the cycling turned from a fun romp into a slog. It was REALLY thick. Leaving Galveston the following morning (on the ferry), we headed to Village Creek State Park in Lumberton, TX. These will be our last two nights in Texas. We’ve chosen this site because it’s about the only spot to camp between Galveston, and the next place we WANT to be – New Iberia, LA. This State Park was a pleasant surprise. It’s located right near the center of a small town. The park itself isn’t anything special, but it is relatively new (about 20 years old). Campsites are level – we have a firepit. 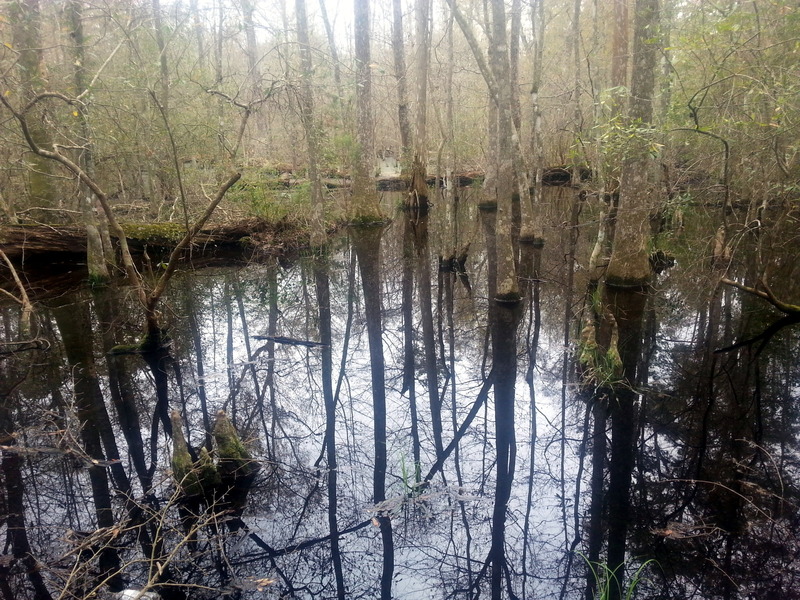 There are trails, although most are under water. 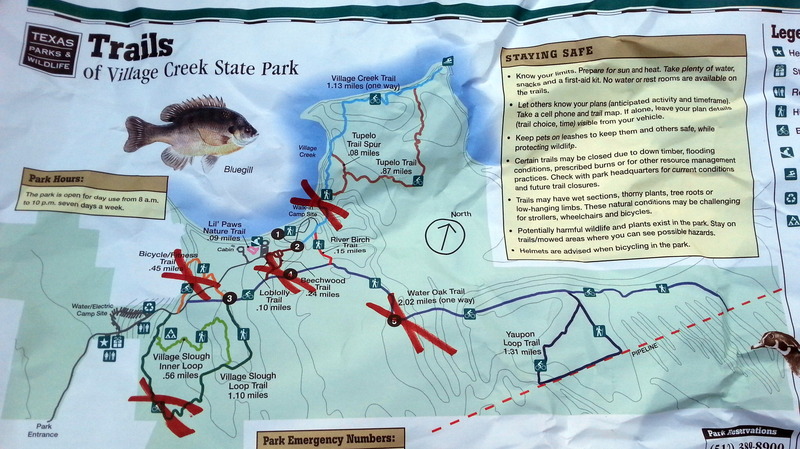 The map they gave us at checkin has the closed trails marked. 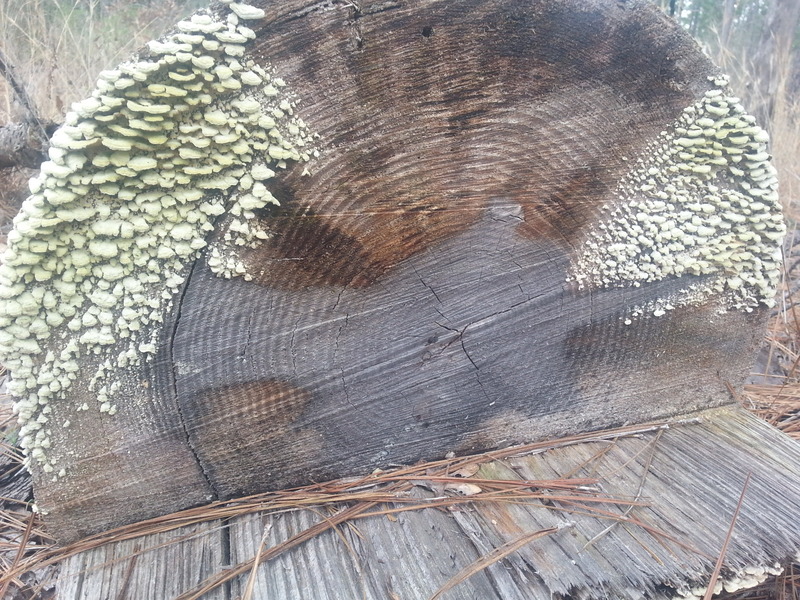 The fungal growths on this sawn tree were unusual in their patterns. 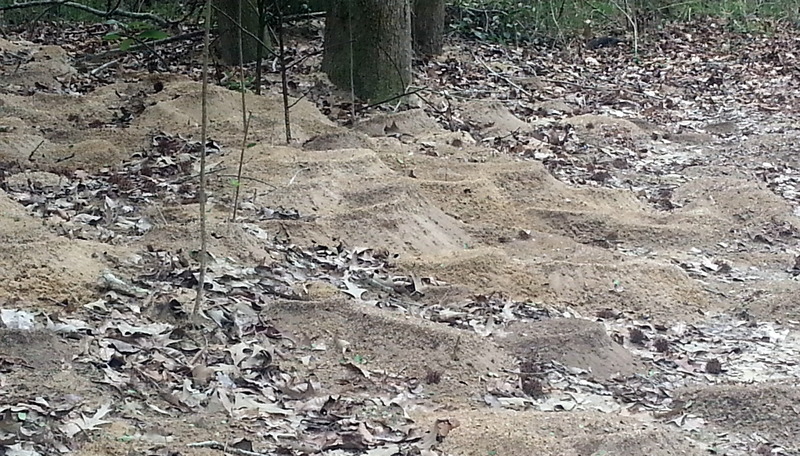 One of the big mysteries we saw were the giant mound of leaf-cutter anthills. 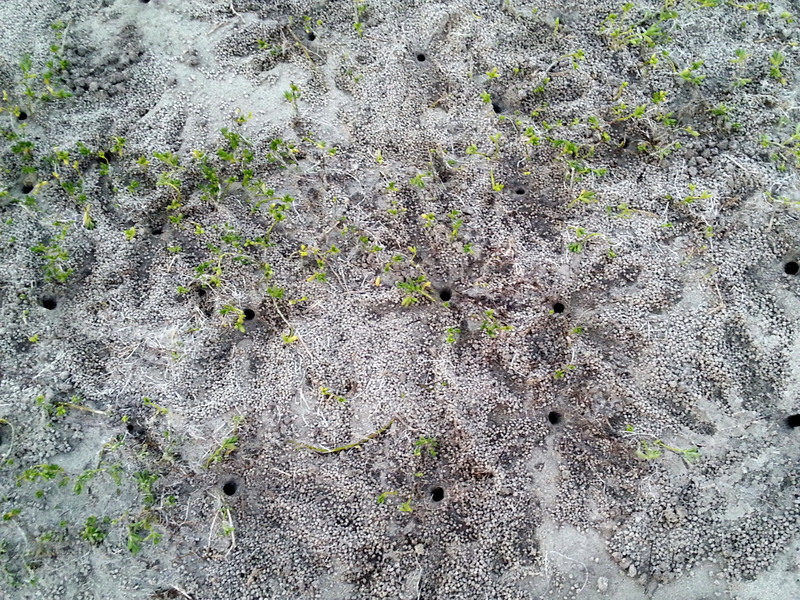 One colony, off by itself, was crazy with ants carrying green leaves OUT of the mound. We couldn’t figure it out – stood there and watched – yep….the leaves were coming out, not going in. 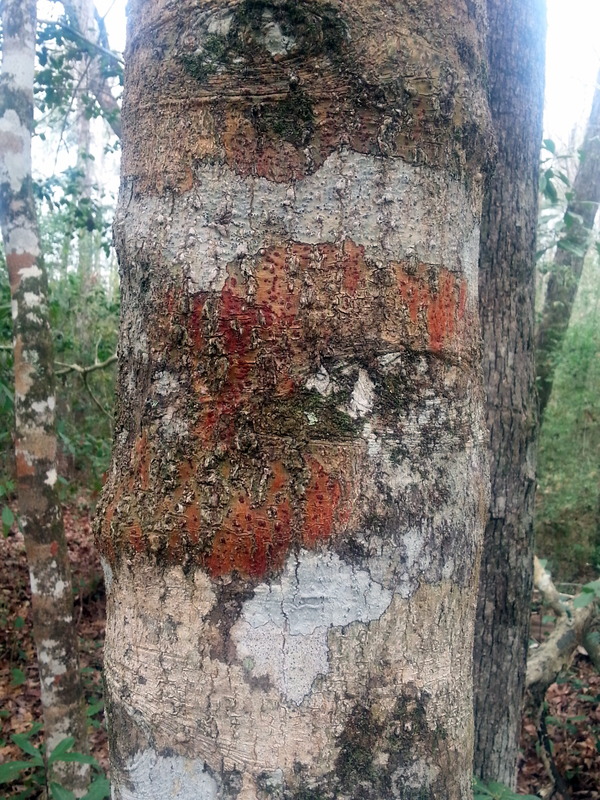 YOu can see a few of the red ants if you look closely. Their ability to carry these large leaf pieces is impressive. Just a ways down the trail was an entire village of mounds. But these did not have the leaves being moved outside. 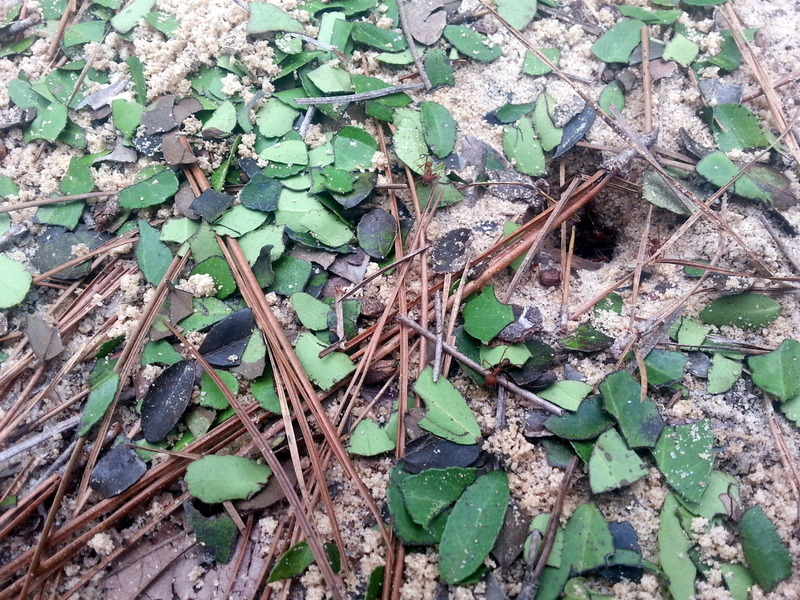 Instead, the ants were carrying other insects in, and moving pieces of sand/ground matter out. 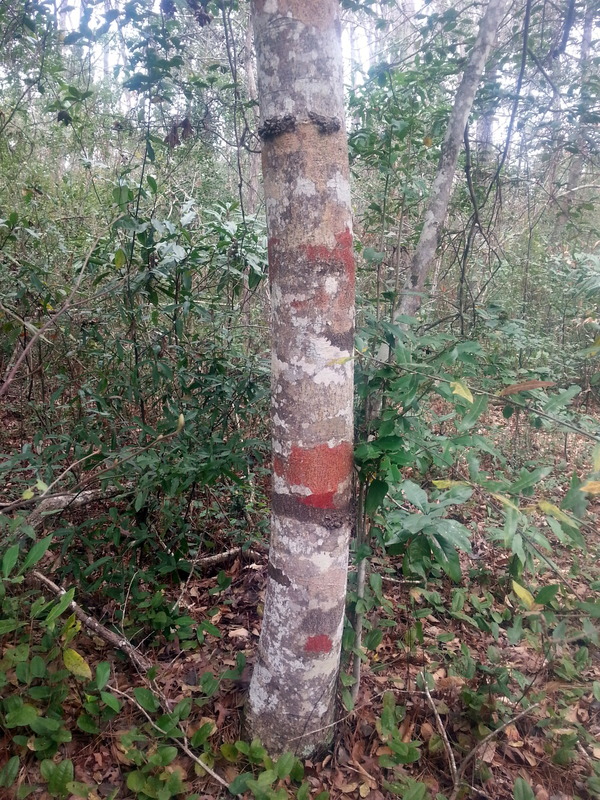 This was the only spot along five miles of trail where we saw any anthills. 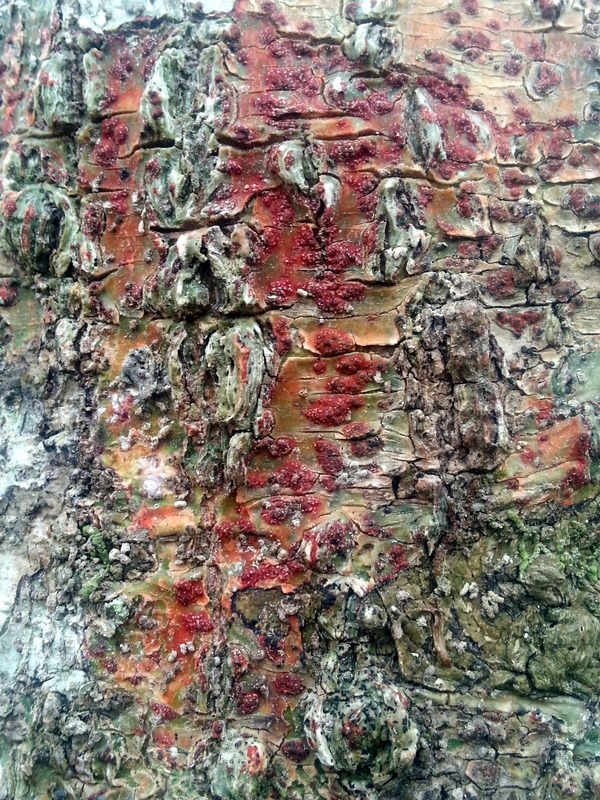 The other aspect of life in East Texas that really intrigued me was the Loblolly Pine. 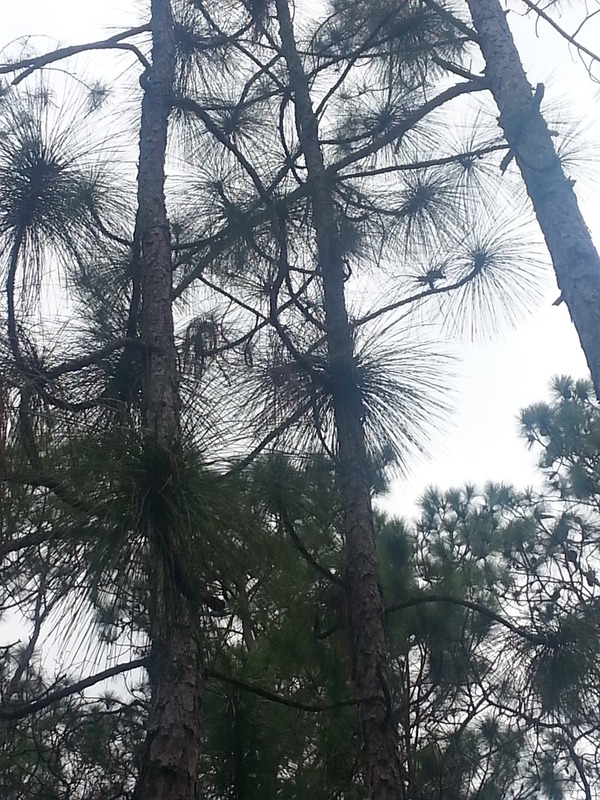 These huge pines grow straight up, and have needles only at the very top. The needles are HUGE – probably 12″-14″ in length. They grow in clumps of 3. We enjoyed wandering around the Trails in this unique area for several hours. The heat and humidity were quite unexpected, though. Down in the swamp, there was zero moving air. I had doused myself with bug spray in anticipation of an attack, and was surprised that we found no mosquitos in the area. Guess they are all in Galveston. So, tomorrow morning we head off for New Iberia, LA. Fans of author James Lee Burke will understand why we are headed there. (For those of you who may listen to audio books while traveling, I have to say that his Dave Robicheaux mysteries are the bomb! The reader Will Patton is incredible). See ya, Texas! We sure made good use of our $70 State Park pass!